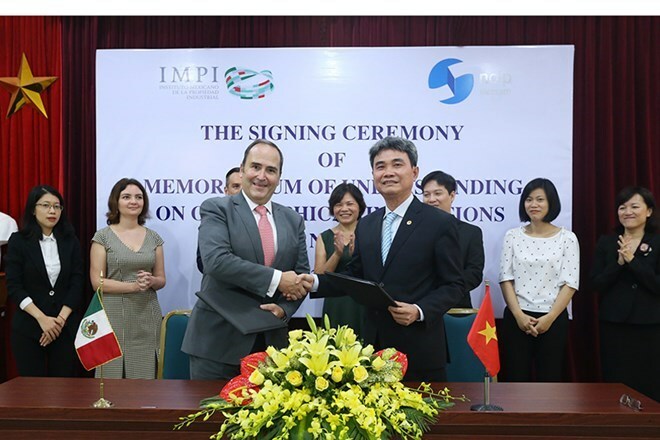 Hanoi (VNA) – A memorandum of understanding (MoU) on cooperation in geographical indication (GI) protection was signed between the National Office of Intellectual Property of Vietnam (NOIP) and the Mexican Institute of Industrial Property (IMPI) in Hanoi on August 21. The MoU aims to increase cooperation and mutual understanding on the respective countries’ GI systems and protection. NOIP Director Dinh Huu Phi said Vietnam has protected 56 GIs, including 50 of Vietnam and six foreign ones. Fifty-four GIs of Vietnam have received protection in Mexico. Meanwhile, there have been 83 brands, five industrial designs and eight inventions of Mexico protected in Vietnam since 2010. He expressed his hope that the two sides will work actively together to build concrete projects within the MoU framework so as to tap into GI-related cooperation potential. Under the document, they are set to share knowledge, experience and work outcomes so as to promote GI protection and management, thus facilitating the commercialisation of Vietnamese and Mexican products with GIs and contributing to each country’s economic development. They will also raise public awareness of GIs, exchange experts to train manpower relating to GIs and relevant fields, and cooperate in GI registration procedures. IMPI Director General Miguel Angel Margain said the MoU ensures a legal foundation for the production and business of products with GIs in each country, helping to fight trade frauds and violations in industrial property.